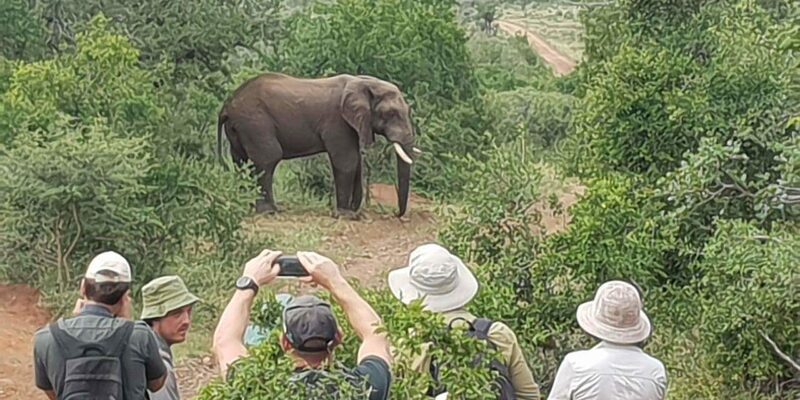 Immerse yourself in the African bush for a few days and come away with not only more knowledge on how intricately entwined nature is but having created space for personal growth. Our Wilderness Trails Experience will expose trailists to the exhilaration of walking in a Big 5 environment where, under the guidance of experienced and knowledgeable trails guides, you will be shown the wonder of our natural heritage as well as taught a variety of bush skills and wildlife skills throughout the four-day programme. All three nights are spent at the comfortably equipped Bhejane Zululand Trails Camp outside of Pongola where trailists are housed in comfortable 2-bed tents. The camp has a communal ablution facility with hot and cold water as well as flushing toilets. Cell phone coverage is intermittent, and trailists are encouraged to avoid using these devices as much as possible so as not to be distracted from the beauty and quiet of your surroundings. 3-nights’ accommodation in two-man canvas dome tents. Transport from Reserve Gate. Private vehicles are left in a secure area at the main gate. All activities on the itinerary. Itinerary in Brief: This is a summary of the proposed itinerary. Activities are subject to change. Each trail group is accompanied by a Lead Trails Guide and a Back-up Trails Guide who are both highly trained and experienced. Both are trained and competent in the use of the rifles they carry, and your safety is their primary focus on the trail. It is essential that trailists obey any instruction issued by either one of them. All trails must have a minimum of six participants otherwise Wildside Trails Co. reserves the right to cancel the trail. If a trail is cancelled by Wildside Trails Co., either a full refund will be given, or trailists will be given the option to book for a future date. A maximum of eight trailists are allowed to participate. We will do all possible to accommodate special dietary requests however this cannot be guaranteed due to the remote location of the camp. · Damage / theft / loss of personal baggage, money and goods. for any emergency services required or may find themselves in a position where they are unable to access such services. · Sickness, quarantine, weather conditions, war, strikes, riots and/or any other cause of any nature whatsoever, however caused and whether as a result of negligence or otherwise. the route, accommodation, price and/or any other aspect as it thinks fit, and any losses and expenses resulting from such cancellation or alteration shall be borne by the traveller. provisions stipulated by Wildside Walking Safari Co. / Wildside Magazine. All traillists are expected to get themselves to and from Bhejane Zululand Trails Camp outside of Pongola, Northern KZN, by means of their own transportation. No 4×4 vehicle is required as on arrival at the game reserve you will be transferred to the camp in a 4×4 game viewer vehicle. Transfers from Durban International or Richardsbay Airport can be arranged at an additional cost. Where possible each trailist will be accommodated in their own tent, however this can only be guaranteed approximately two weeks before departure. Should the camp be full, a maximum of two people will be accommodated in each tent. Tents are shared by same-gender participants unless travelling as a couple. If you would prefer to guarantee that you have single occupancy of your tent rather than share with a fellow trailist ( of the same gender ) at the time of booking , the single occupancy rate is R7575. Children pay full adult rate. There is no maximum age restriction, but participants must be physically fit. Participants over 65 should produce a doctor’s certificate confirming they are fit to participate. No children under 15 years are allowed to participate in the Wilderness Experience for safety reasons. All children under the age of 18 years must be accompanied by an adult. Proof of age will be requested at the time of booking. Trailists need to be walking fit and able to walk unaided for up to four hours at a time at an average pace of 2km per hour. If the trails guide feels that a person isn’t going to cope and could pose a danger to fellow traillists, he has the right turn that person away upon arrival. No refunds of trail fees are payable in this instance. Traillist may bring a small amount of alcohol to enjoy around the evening campfire, however, no excessive drinking will be allowed for reasons of safety and so as not to detract from the wilderness ethic. Should traillists insist on excessive drinking, the walks will be cancelled until the head trails guide deems everyone fit to walk. This is for your safety as well as that of your fellow traillists. A good guideline is to keep within the legal alcohol limit for driving a vehicle. 50% deposit within 5 working days of confirmation of booking. The balance is payable six weeks before the departure of the trail. All participants will be required to sign an indemnity before they can participate in the trail. This will be sent to you upon confirmation of your booking. PreviousConservation Canine Annie nabs three poachers in one day!